Slightly over 48 years ago, President Lyndon Johnson took a trip to Independence, Missouri to sign the newly passed Medicare bill. Independence was the home of former President Harry S. Truman who had worked tirelessly during his administration to pass a Medicare type program. 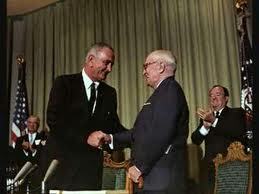 Johnson came to Missouri to honor Truman with the first Medicare card issued. Medicare is but one of the many programs that Republicans are bent on either eliminating or drastically changing shoupd they ever be put in charge again. As it is when Republicans have but one chamber of the government they can cause a tremendous amount of trouble. They can halt needed reforms to safety net programs and at the same time stop any chance of creating needed jobs. Currently Republicans have their sights set on destroying the food stamp program which is now known as SNAP. Doing so will force millions of Americans into starvation. My guess is that in their estimation, a starving person will work for nearly nothing or die. What they are doing is so against the history of the United States and all major religious movements one could say it is simply out of the mainstream of humanity. But when you have all the money you needn’t worry about anyone else. “The benefits under the law are as varied and broad as the marvelous modern medicine itself. If it has a few defects–such as the method of payment of certain specialists-then I am confident those can be quickly remedied and I hope they will be. If you sincerely believe that the next election means nothing pull up a chair and give a listen. A little over 40 years ago, America was on the move to what Lyndon Johnson called the Great Society. There were laws passed to bring those who had been purposely excluded into the mainstream of political life in America. Then the Republican Party sold its soul to the forces of the dark in order to win a few elections. Thus they laid the groudwork for what the basis of their party would be from thence forward: The ends justify the means. Republicans created the Southern Strategy where they invited groups that were still fighting the Civil War into their party to continue their fight. With this group and others opposed to equality for all citizens and backed by huge money, the Republican Party arose to win some elections. But the price has been to roll back much of what made America the so-called shining city on the hill. Republicans now are the party to end the American way of life. Unions have been all but vanquished. Still targetted are programs like Social Security, Medicare, SNAP, medicaid, Head Start, and many other programs which helped alleviate some of the pain of poverty or old age and programs that helped preserve the middle class. Next election we need every American who believes that America can be a great country for all, not just the rich few, to get active and elect politicians who can make that happen. Bruce Braley, Dave Loebsack, local Democrats for local offices and of course a Democratic governor. That is in Iowa. Where ever you live, the Deemocratic Party will be the Party running candidates who believe in the American people. I am old enough to remember what happened before Medicare. Do we really want to let the Republicans take us back to a time when old people died in poverty from starvation and lack of health care? They will not tell you that is what they stand for, but it is what their platform truly is. This entry was posted in Health Care & Medicare, Medicare, Social Security and tagged Great Society, Head Start, President Johnson, SNAP. Bookmark the permalink.